As UT Austin’s 132nd Commencement approaches this weekend, I want to send my sincere congratulations to our graduates and their families. 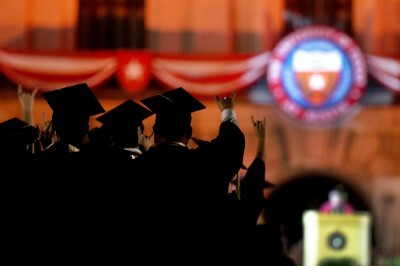 Graduating from The University of Texas is a tremendous achievement and a profound milestone in your lives. I’m proud of every one of you. • Some 9,007 degrees will be awarded this weekend to a total of 8,667 graduates. The majority are women, who outnumber men by more than 200. • We will award 6,104 bachelor’s degrees, 2,042 master’s degrees, and 861 doctoral degrees. • Harris (Houston), Travis (Austin), and Dallas counties sent the most students to this year’s graduating class. • California, Illinois, and New York are the top contributors of out-of-state students. • China, India, and Korea are the top contributors of foreign students. • There are eight degree candidates under the age of 20 and 10 over the age of 60. • Our College of Liberal Arts has the most graduates of any of our 17 colleges and schools. • The most popular major in the Class of 2015 is Business Administration. Again, my warmest congratulations to all of our graduates. I hope to see you all at our University-wide Commencement Ceremony on the Main Mall Saturday night at 8 p.m. This year’s keynote speaker will be Darren Walker, an inspirational UT alumnus and president of the Ford Foundation.